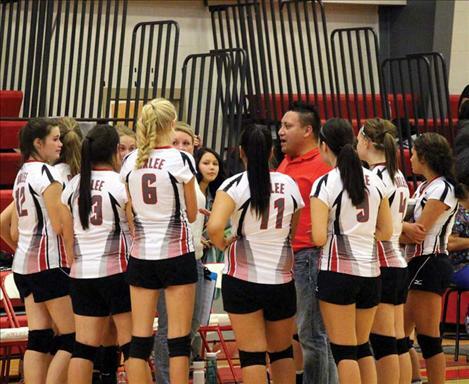 ARLEE – The Scarlets have started their season with some bright spots, winning three out of four matches and putting up a fight every time their feet touch the volleyball court while refusing to close the door quietly. With only one senior on the roster, the Scarlets junior-laden team shows teamwork and skill is what it takes to win matches, something the Scarlets all have, according to Head Coach Brian Big Sam. While Big Sam gives props to his whole team, not wanting to single out a single athlete, senior Violet Pablo has been fulfilling her job in the leadership role, leading not in the “rah-rah, go get ‘em” kind of way, but by setting the example. Though taking their first loss of the season, the Scarlets kept set scores close, ending in a split for the week. On Thursday Arlee hosted Two Eagle River’s Lady Eagles and picked up the 3-1 victory. 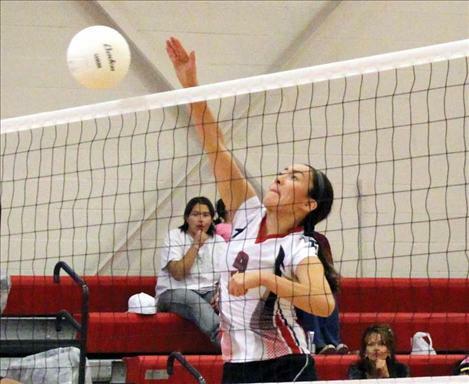 Pablo led in kills with 12, while Abby Yokum served up five aces for the Scarlets. Saturday the Scarlets battled in St. Regis against conference foes the Lady Tigers. Though keeping the set scores tight, the Scarlets met their demise in the fifth and final set with the Lady Tigers grabbing the edge in the 31-29 game. Despite the loss, Pablo had a tremendous game with 16 kills and five aces. Autumn Moran chipped in 18 digs for her team. As the season is still in the infant stage, Big Sam doesn’t want to cross his T’s and dot his I’s just yet, but believes the Scarlets have a shot at a good postseason run. The Scarlets will continue their fight hosting Hot Springs Sept. 18 and then will travel to Mission to take on the Lady Bulldogs Sept. 20.